LOS ANGELES – The National Academy of Sports Medicine (NASM) and fitness business coaching company NPE have announced a long-term partnership to offer personal trainers business systems, training and resources to grow their client base and achieve success in the fitness industry. 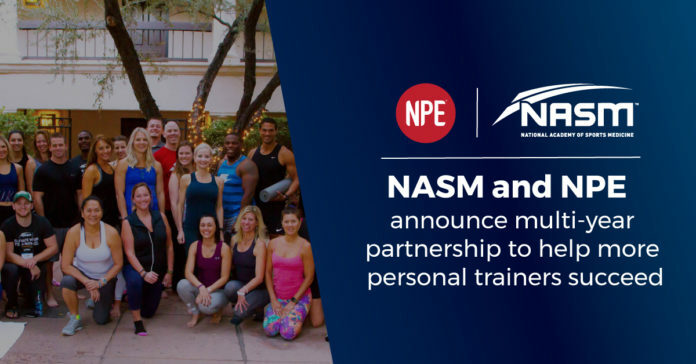 The partnership pairs two premier industry leaders to provide immediate benefits to existing and future NASM-certified personal trainers. NASM will now offer NPE-licensed fitness business content through its NASM Business Accelerator Program, so personal trainers will have access to NPE’s proven business-building systems through on-demand learning modules, tools, templates, and coaching calls. In addition, NASM certified personal trainers will have new access to NPE workshops, events, and other valuable training resources. “This benefits NPE clients by giving them a runway to access the best interns and new trainers who can help with the current growth of their business,” said Greeley. Greeley will be speaking at the upcoming NASM Optima conference, October 11-14, 2018 in Scottsdale, AZ, and will be delivering new sessions on fitness business building strategies. The earning potential for certified personal trainers has risen nearly 40% since 2010, according to data from the Bureau of Labor Statistics*. Together NASM programs and NPE fitness business education will help more personal trainers strengthen their earning potential while building strong fitness businesses across the industry. Since 1987, the National Academy of Sports Medicine® (NASM®) has been a global leader in providing evidence-based programs for fitness professionals. In addition to its NCCA-accredited Certified Personal Trainer (CPT) exam, NASM offers a progressive career track with access to continuing education and specializations including the Corrective Exercise Specialist (CES), Fitness Nutrition Specialist (FNS) and Performance Enhancement Specialist (PES). In the last 10 years, NASM has certified and re-certified over 190,000 personal trainers. In 1983, the Athletics and Fitness Association of America (AFAA) pioneered the scientific approach to group exercise by releasing the first nationally standardized guidelines for fitness professionals. It has since prepared over 350,000 instructors and trainers in 73 countries. To learn more about NASM, visit www.nasm.org or call 1.800.460.NASM. Unlike other thought leaders, education providers, mastermind groups, and marketing agencies that only offer “bits and pieces” of knowledge and support, we’re the only ones that deliver a comprehensive and complete suite of fitness business services that covers everything needed to grow profitably and ensure long-term success. *Bureau of Labor Statistics, U.S. Department of Labor, Occupational Outlook Handbook, Fitness Trainers and Instructors, on the Internet at https://www.bls.gov/ooh/personal-care-and-service/fitness-trainers-and-instructors.htm (visited September 13, 2018). Mean annual wage was $39,410 in 2014 and $32,277 and rose to $43,720 in 2017, the last year statistics are available.